Our Swim School is structured to provide a safe and nurturing aquatics experience for all students. From novice to competitive level swimmers, our lessons encompass proper swim instruction, technique, and endurance workouts. We offer swim lessons in both private and semi-private formats. All children must be toilet trained in order to participate in swim lessons unless enrolled in an infant/parent class, in which case a swim diaper and a Tiny Tush plastic cover are required. This program puts you in the water with your child. Our instructors will lead you through fun activities and exercises that will teach your child the basic skills of buoyancy, propulsion, and breath control. Our instructors will teach your child to become more confident in the water. They will learn how to control their breath, float, propel their body forward, submerge under the water, and arm and leg motions. Our instructors will build on the Level 1 foundations of breathing, floating, and arm and leg actions. They will begin to float unassisted, self-propel through the water using alternating arm and leg actions. Treading water and beginning diving progressions will also be introduced. School-age Level 3 will build on Level 2. Students will swim completely unassisted, begin to breathe to the side on freestyle, and learn to swim comfortably on their back. Instructors will work on endurance for swimming longer distances and treading water. Our instructor will teach breathing techniques, floating, swimming techniques, and stroke mechanics. You will learn to become more comfortable and confident in and around water. Participants will learn the following basic swimming skills: breathing patterns, floating, putting face in water, kicking, and basic stroke motions. If the weather does not allow us to enter the pool, we will hold a dry land lesson for swimmers as a supplement lesson. Dry land lessons will teach your child the movements of swimming as well as better body control for swimming in the pool. Make-up classes will not be given for missed sessions. *There are no make-ups given for missed sessions. Our instructors will assess each swimmer at the beginning of their first 30 minute session and design a program that best fits the needs of the individual. Lessons are scheduled by appointment with the instructor. For more information contact Brad Hudak at bhudak@thearenaclub.com. A child age 12 and under must pass a swim test in order to utilize the diving board and water slides. Any Child under the age of 12 must pass the swim test or must stay within arm’s reach of an adult. All guards can administer a swim test as long as they are not on stand. Anyone who passes the swim test will get a black X on their right hand from a lifeguard. Everyone who passes the swim test will have their name written in our swim test log, and entered into the computer, along with their parent’s phone number, date of birth, and the lifeguard's initials. Any child can be asked to retake the swim test at any time (even if they have already passed). Children under 12 may complete one attempt per day to pass the swim test. Step or jump into Deep end of Rec Pool and return to the surface. Float on back keeping your mouth and nose out of the water for 10 continuous seconds without kicking or grabbing on to the side of the pool. Climb out of the pool without using the ladder. Year-Round Swimming & Aquatics Programs for Everyone! We swim rain or shine! Our pools are under sunshine and palm trees in the summer and covered and heated in the winter. 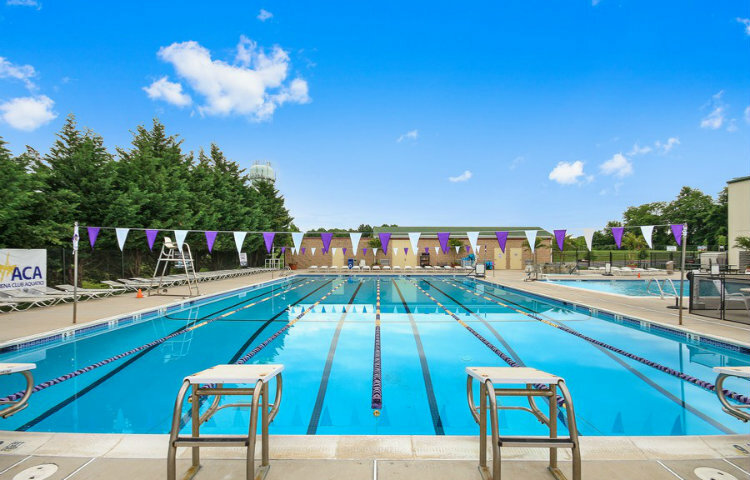 Enjoy aqua fitness classes, swim lessons, or ramp up your skills with one of our swim teams!